The 2019 finalists are Emma Dunbar, violin; Ayari Kasukawa, saxophone; Lexie Krakowski, cello; Jeanel Liang, violin. The first prize winner will have the honour of performing as a soloist at two concerts of the Sooke Philharmonic Orchestra in October this year. The competition is part of the Sooke Philharmonic Society’s commitment to support and encourage the musical development of regional young musicians from the Gulf and Vancouver Islands. It is open to instrumental and voice students up to and including the age of 25 years who are studying privately or at accredited regional music institutions. Don Chrysler was a Sooke area resident who in his lifetime shared his time, effort and bounty to support the artistic endeavours of others. It is in his memory that his many friends have donated to a Concerto Fund. Admission is by donation. 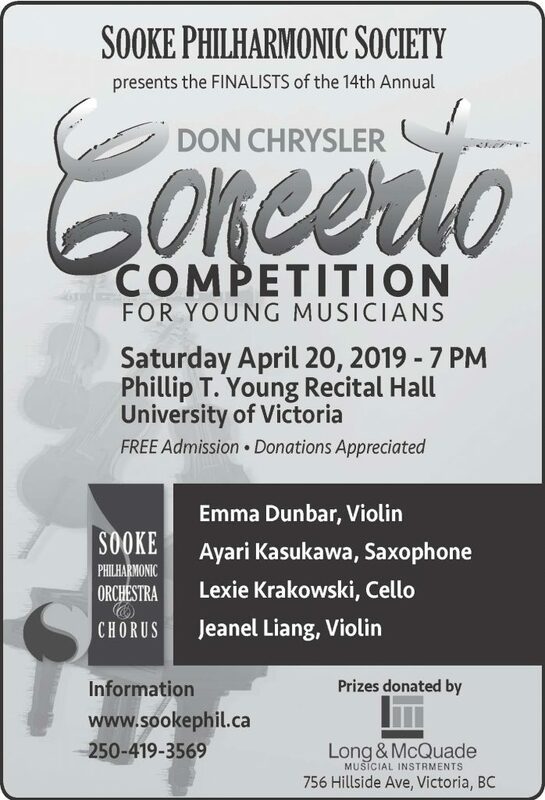 The final competition will take place at the Phillip T. Young Recital Hall, UVIC, 3800 Finnerty Road, Victoria, from 7 to 9:30 PM, Saturday April 20, 2019. 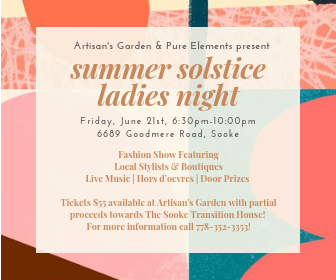 For more information contact sookephilharmonic@gmail.com or 250-642-5760.